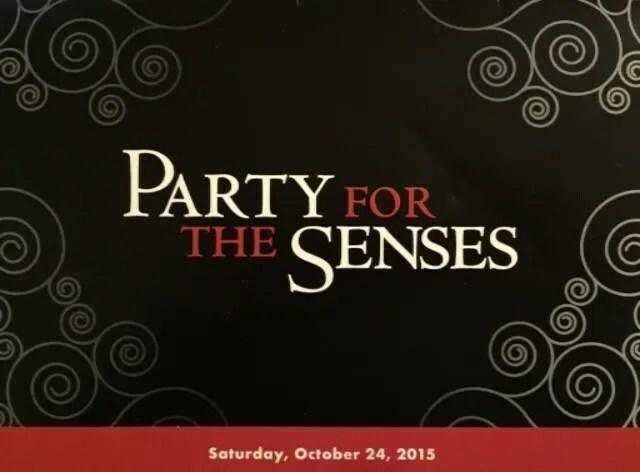 First of all, here is the information (copied from the official Disney World website) regarding the Party for the Senses featuring Disney Chefs Around the World which I attended on Saturday, October 24th. Come along on a grand culinary tour, as led by many of the most revered minds behind the world of fine dining! 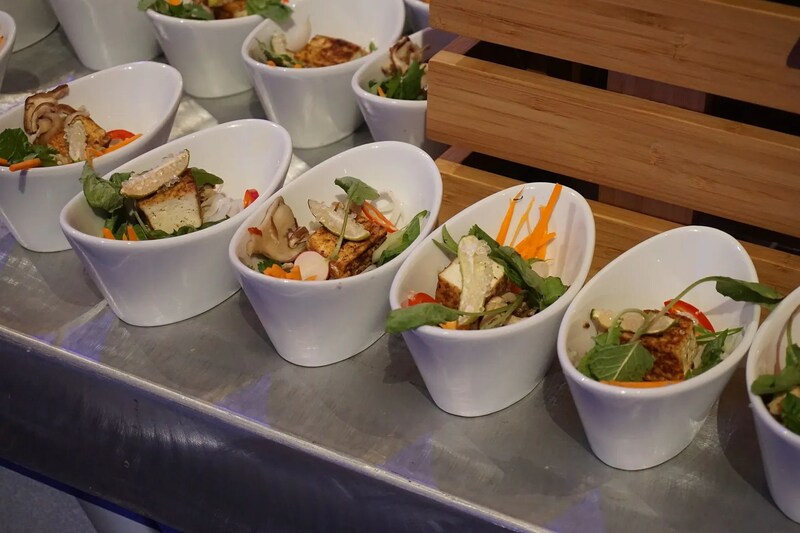 At Party for the Senses featuring Disney Chefs Around the World, you can set out on a culinary journey like no other—one that guides Guests like you through tastes and techniques from the United States, Europe, Asia and beyond. Follow along as the pros direct you from station to station, and show you samples of cuisine that best represents their culture—as well as the Disney Parks and Resorts they call home! After attending two Parties last year (one general admission and the other reserved seating), I felt that the reserved seating was worth the extra $30. Luckily I was able to get a reserved seat when I called shortly after booking began for the Food & Wine Festival special events. Note that while the general admission could be booked online, both the reserved seating and the Wine View Lounge had to be booked by phone. Though we were told that we would be allowed to enter at 6:45, I knew from my experiences with the parties last year that we would likely be seated earlier than that. Therefore, I checked in at the World ShowPlace Pavilion (located between the UK and Canada pavilions) at about 6:00. I was disappointed that unlike last year, they were not giving out the booklets which listed the food and beverage menus for the evening. I even asked for one when I wasn’t given one and was told that there would be a booklet at my table when I was seated. We found that last year this was a great way to pass the time while waiting in line. My DH and I were able to form a plan of attack once we identified the items which we were most interested in. Anyway, though the Reserved Seating and WVL guests were not given the booklets in advance, the General Admission guests were given them along with their plastic tray and wine glass. So I have to say that I was a bit jealous of the GA guests for the short time that I was standing in line. Hopefully next year they will go back to giving out the booklets to everyone at check-in. They began seating the WVL guests at about 6:20ish I think. Once they were all seated then it was our turn. Though I was not very close to the front of the Reserved Seating line, their seating process is very quick and organized so I was seated at my table for 1 by 6:30 (according to the time on my first photo taken inside). There were tables for one person on each side of me and we were seated at the very front of the Reserved Seating section, with only the aisle between us and the gated community of the Wine View Lounge. The gentleman seated to my right was friendly and we compared notes throughout the evening. Also our server was very nice and from the beginning of the party to the end she provided us with exceptional service. 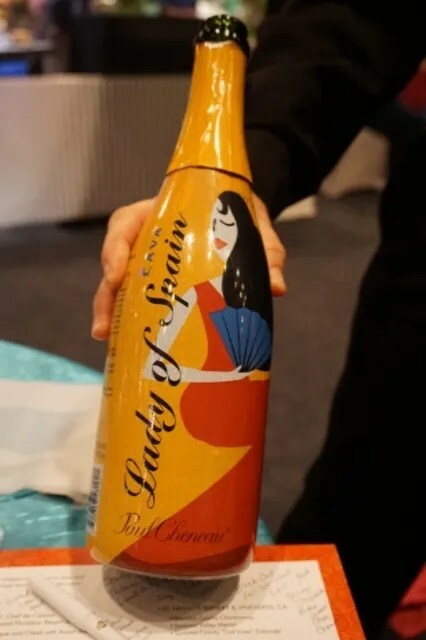 She began by giving us a very generous pour of the included sparkling wine for the kick off toast. Last year we were not offered a second glass, but this year our server was much more accommodating. Since I really liked this wine, I drank two or three more glasses throughout the evening. Now on to the other beverages and food. Of the promised 50 tasting stations, 26 of these were food and 24 beverages. Of the 24, about 15 were serving wines (usually 3 different wines from the same winery at each station). About half of these were domestic (all West Coast), but wineries from France, Italy, Chile, and Argentina were also represented. Most of the U.S. wineries were familiar to me, like La Crema and St. Francis of California, but I hadn’t heard of any of the foreign wineries other than Louis Jadot of France. The rest of the 24 beverage stations were serving beer (4 stations), champagnes (1 station), coffee & tea (2 stations – Joffrey, Twinings), and one station was serving a frozen chew-tini cocktail. The 50 tasting stations were divided into 6 sections in the large room where the party is held. Most of these included 3 or 4 different food stations, except for the section in the back of the room which had 9. So let’s begin our tour of the food stations in Section 1 with the Cypress Grove Cheeses station (hosted by Gourmet Foods International). At the first party that I attended last year I made the mistake of visiting this station first and filling up on the wonderful cheeses, crackers, fresh fruit etc. 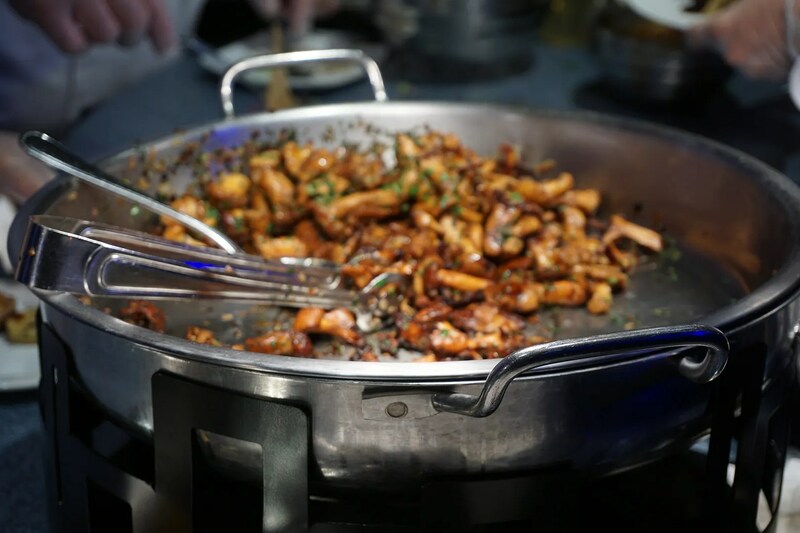 This made it difficult to get to very many of the food stations which were hosted by the Disney chefs. Having learned my lesson, I did not visit the cheese station until the end of the party. The downside though was that by that time I was too full to try anything and just took some photos. 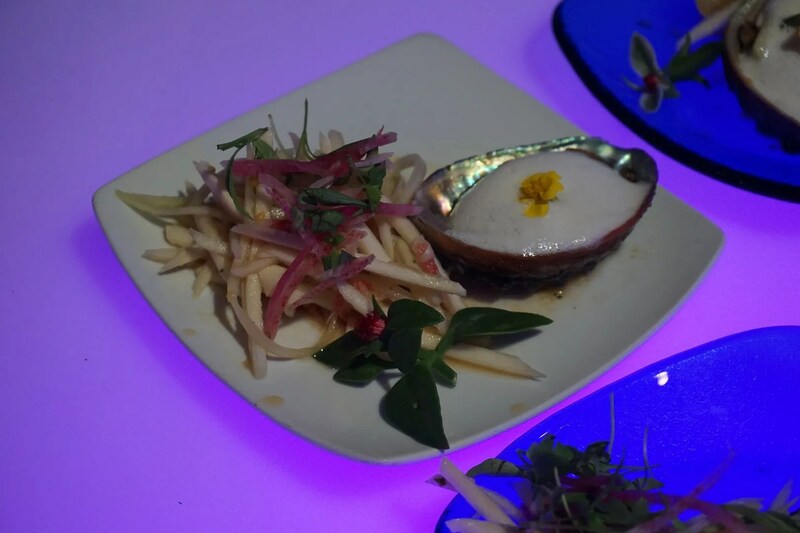 Also in Section 1 was a station hosted by Masayoshi Suzuki, Executive Chef for Tokyo Disneyland and DisneySea, Here they were serving Braised Veal Cheek and Yuzu-flavored Daikon Radish with Miso Sauce. While I did get to more of the food stations this year than last, there were about 6 or so of the remaining 24 (not counting the 2 cheese stations) that I didn’t taste the offering. The veal cheek was one of those. The last food station in Section 1 was hosted by Brian McLaughlin, Standards Traveling Chef for the Disney Cruise Line. 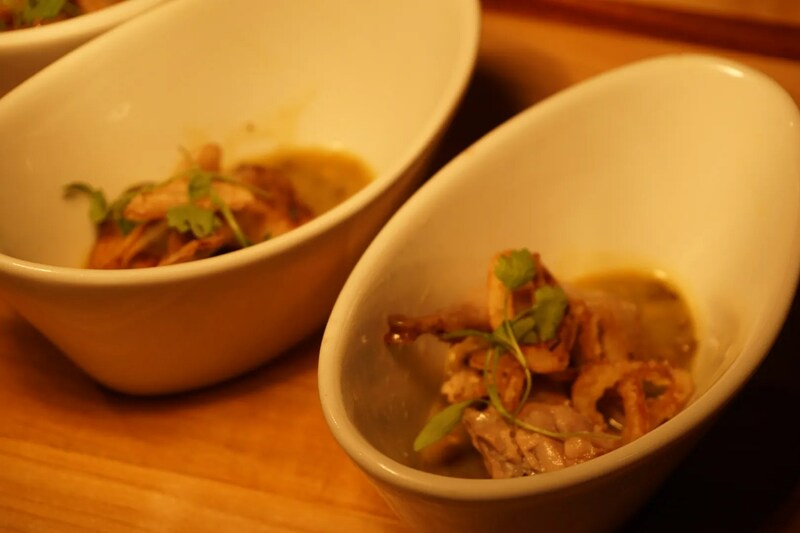 They were serving Quail Mulligatawny with Crispy Onion Rings and Micro Cilantro. This was another thing that I didn’t get to. I did though taste three of the four foods which were served at the stations in Section 2. The first of these stations was hosted by John State, Executive Chef of the Disneyland Resort. 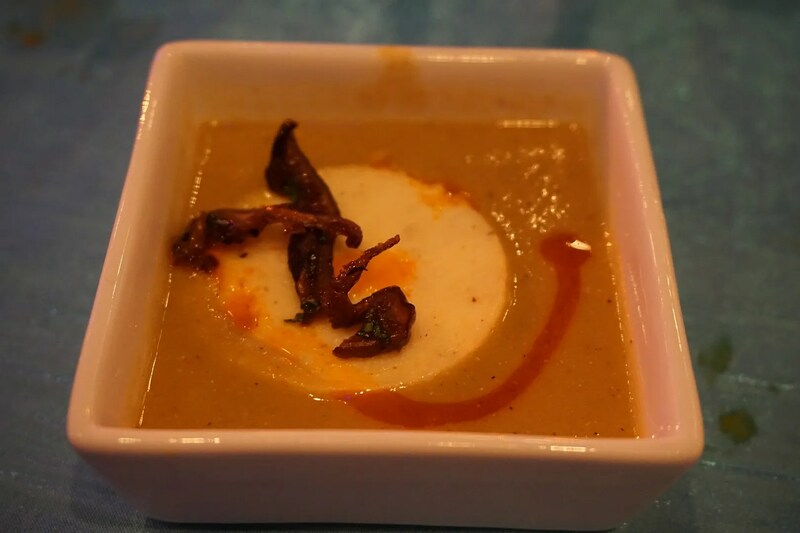 He and his staff were serving Crab Bisque with Sweet Corn, Indian Curry, and Coconut. This was good but had a little more spice than I care for, I assume from the curry. 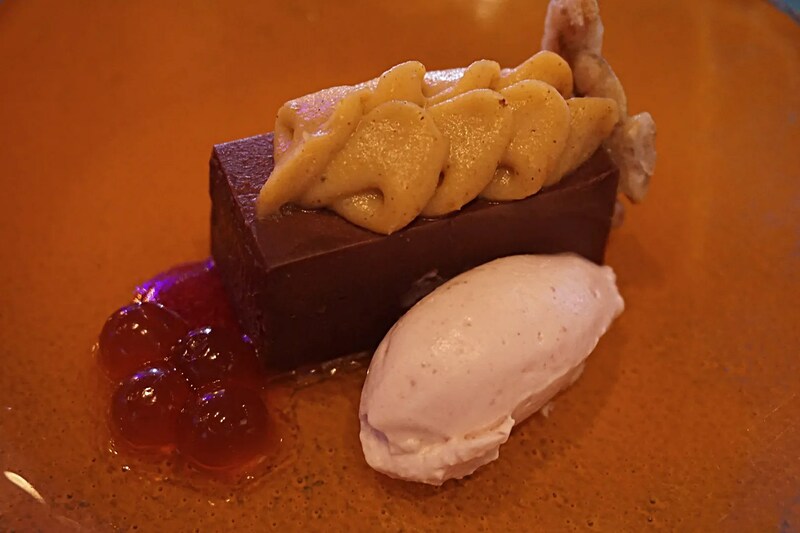 I also got to try the dessert that was served at the station hosted by the Executive Pastry Chef of the Disneyland Resort, Jean-Marc Viallet, and the Assistant Pastry Chef from Disneyland’s Grand Californian Hotel, Nubia Renteria. This was Disneyland’s 60th Celebration Cake – Flavors of Chocolate, Salted Caramel, and Tropical Fruits. It was very good! 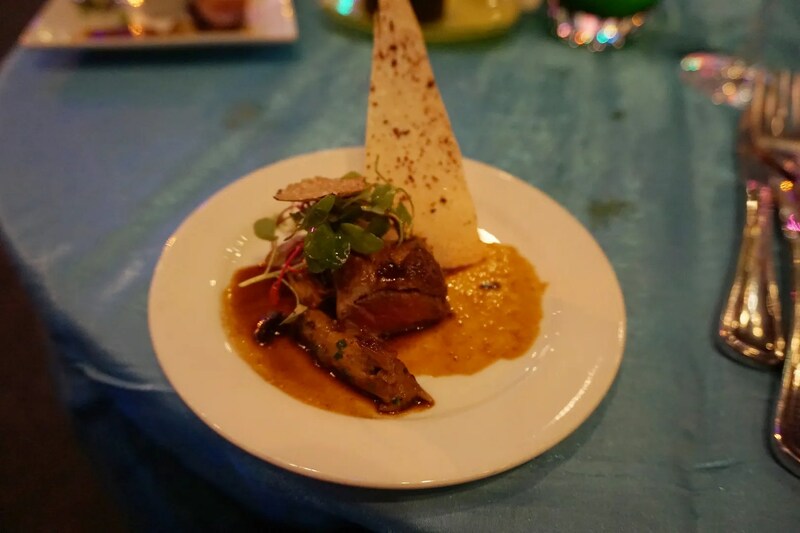 The third station in this section was hosted by the Executive Chef and Chef de Cuisine of Epcot, Gregg Hannon and Michael Deardorff respectively. 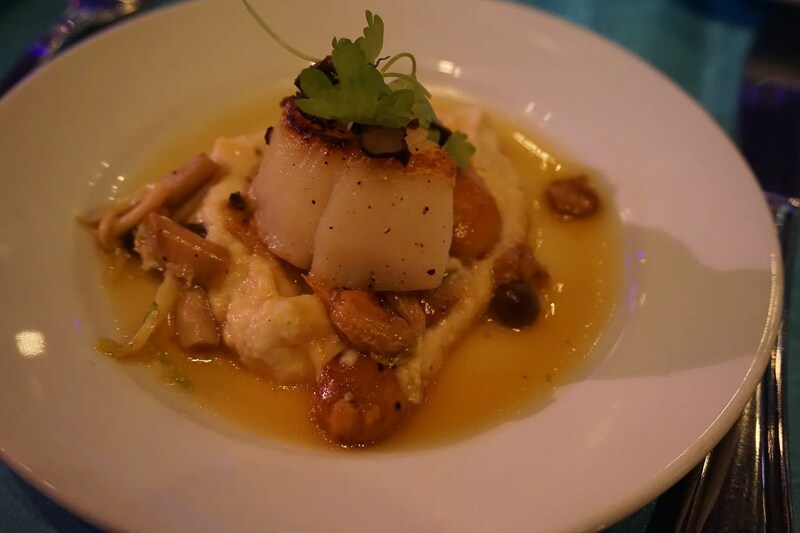 They were serving Seared Scallops with Celery Root Puree, Parmesan Truffle Nage, Wild Mushrooms, and Brussel Sprout Leaves. This was very good and among my top 5 favorites of the evening! 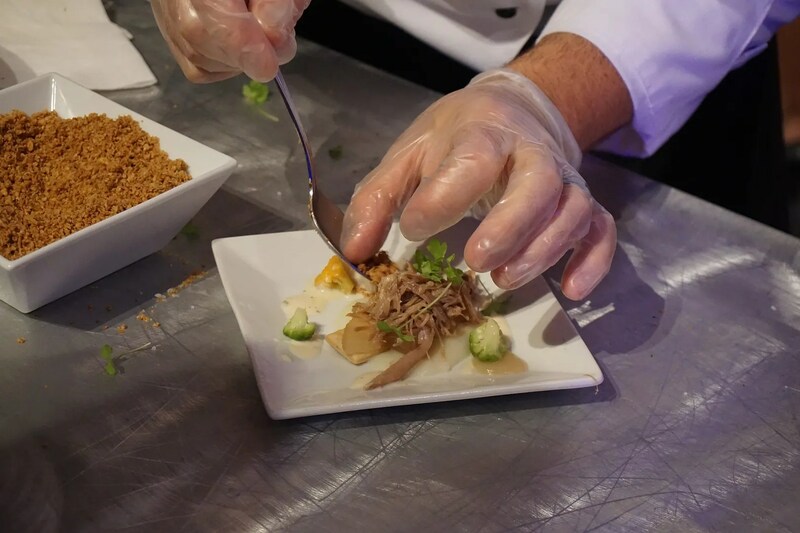 The last station in Section 2 was hosted by the Chef de Cuisine and Sous Chef (Leonard Thomson and Edgardo Ruiz) for Epcot’s Park Event Operations. 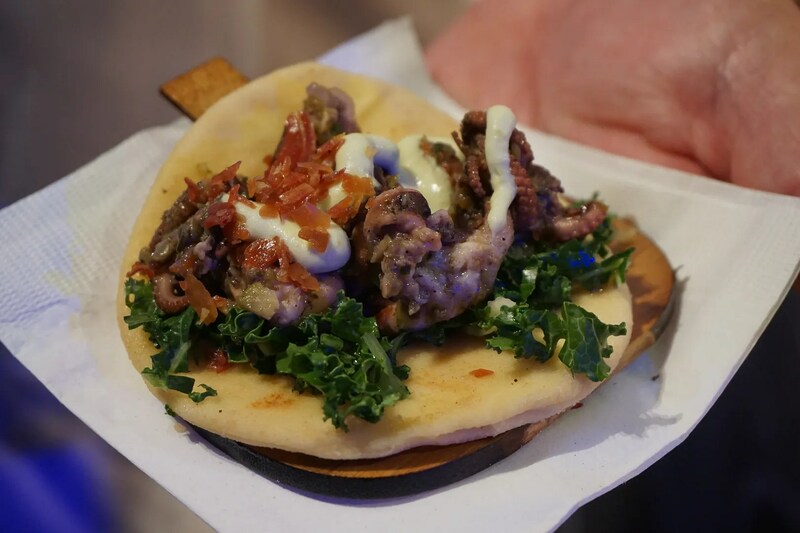 They were serving Char-grilled Baby Octopus with Olives and Capers served on No Gluten Added Flatbread with Quick Pickled Kale, Roasted Fava Bean Puree, and Fried Prosciutto. This looked good but not being a fan of octopus, I passed on this one. However the chefs at this station were very nice and volunteered to hold one for me while I took a photo. Now on to Section 3 where we will begin at the station hosted by Emmanuel Onillon, Executive Chef of the Disney Hotels at the Paris Disneyland Resort. They were serving Roasted Fillet of Venison with Juniper Berries, Spicy Red Wine Sauce, Autumn Vegetables, and Fruits in Vanilla Oil. This looked gorgeous, which is why I decided to try it despite the fact that I’m not crazy about venison. The meat was okay but needed the sauce, and the red wine sauce which accompanied it was bitter tasting. The other two food stations in Section 3 were serving desserts. 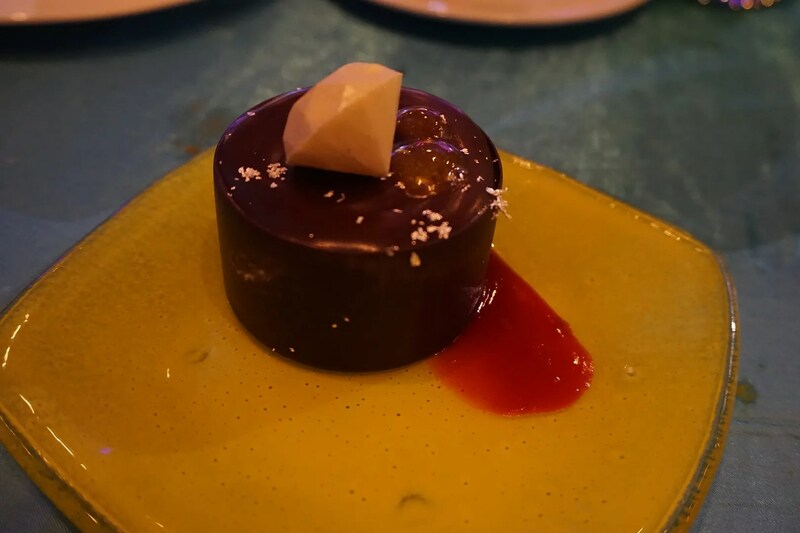 The first was hosted by Roger Luk, Pastry Chef at Hong Kong Disneyland, who was serving Sea Salt Caramel and Chocolate Mousse Cake with Passion Fruit and Mango Coulis. This was both beautiful and very tasty! 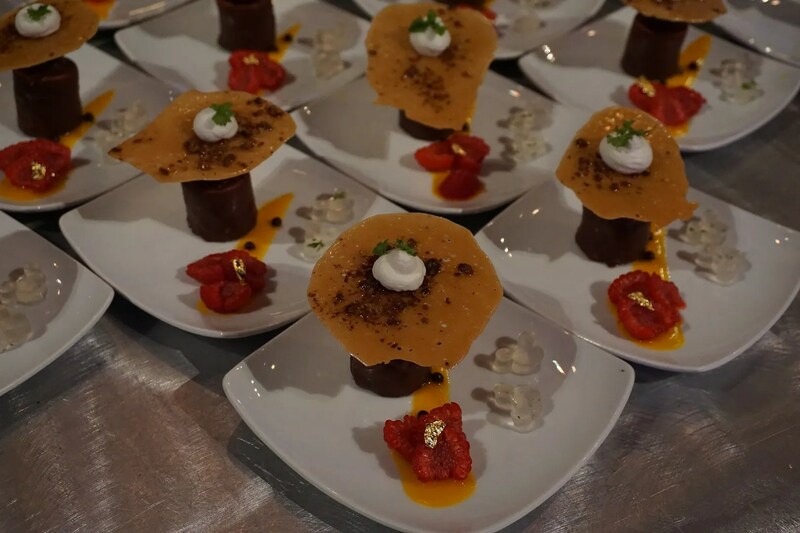 The other dessert station in this section was hosted by Deran Lanpher, Pastry Chef for the Yacht & Beach Club Resorts. 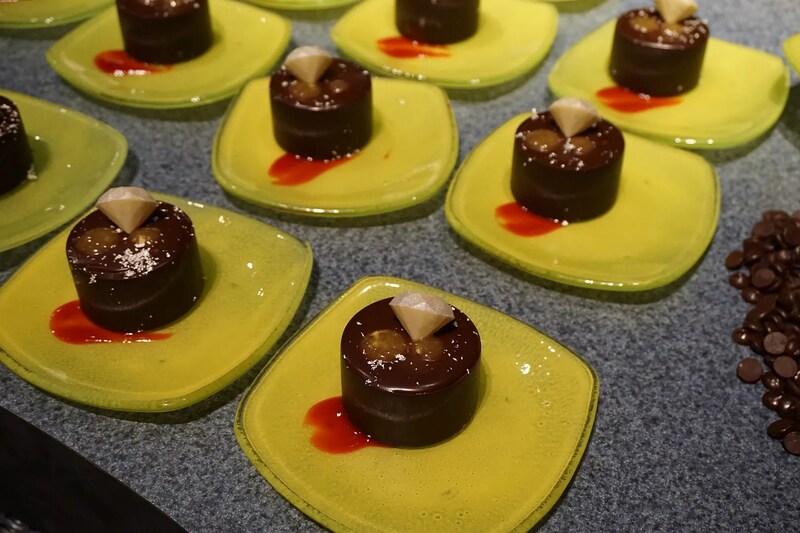 Chef Lanpher was serving Roasted Pumpkin Cheesecake, Manjari Ganache, and Cranberry-Cherry Cream. I thought I was really going to like this one but it ended up being my least favorite of the 5 desserts offered at the party. Section 4 will be the last one I will cover in Part I of my review. In this section was the station hosted by Phillip Ponticelli, Chef de Cuisine of the Grand Floridian’s Citricos restaurant. He and his assistants were serving Cheshire Pork Tongue and Cheek with Anson Mills Cheese Grits. I was a little hesitant about trying this one, as the idea of eating an animal’s tongue wasn’t really appealing. But I have met Chef Phillip before, as he is a friend of a friend, so I felt like I should give it a chance. I was pleasantly surprised that it was pretty good. Not good enough to make my top 5 favorites, but better than I was expecting. An offering that did make my top 5 favorites was served at another station in Section 4. 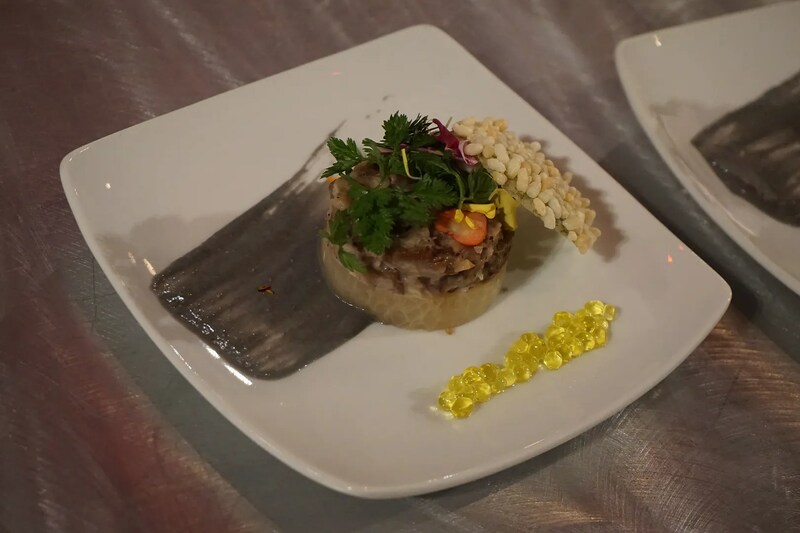 This one was also hosted by a Grand Floridian chef, Scott Hunnel, the Chef de Cuisine at the resort’s premier restaurant, Victoria & Albert’s. 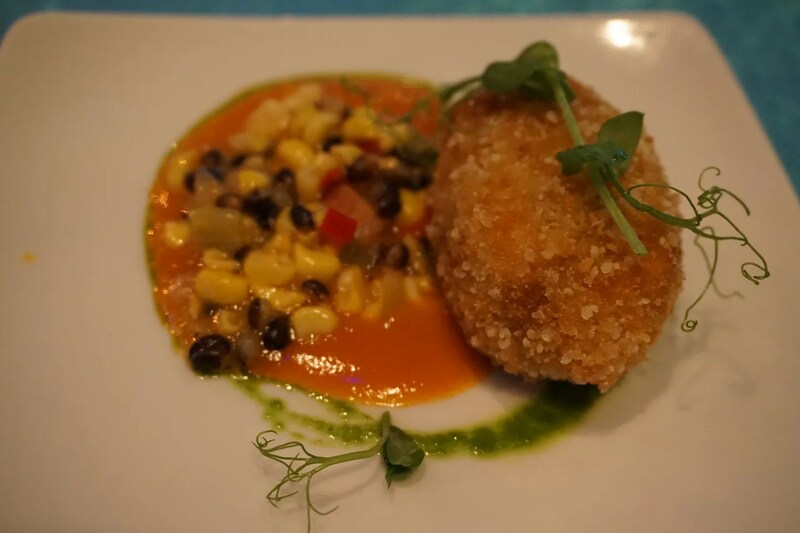 Chef Hunnel and Sous Chef, Tom Hill, were serving Espellette Pepper-spiced Shrimp Croquettes. 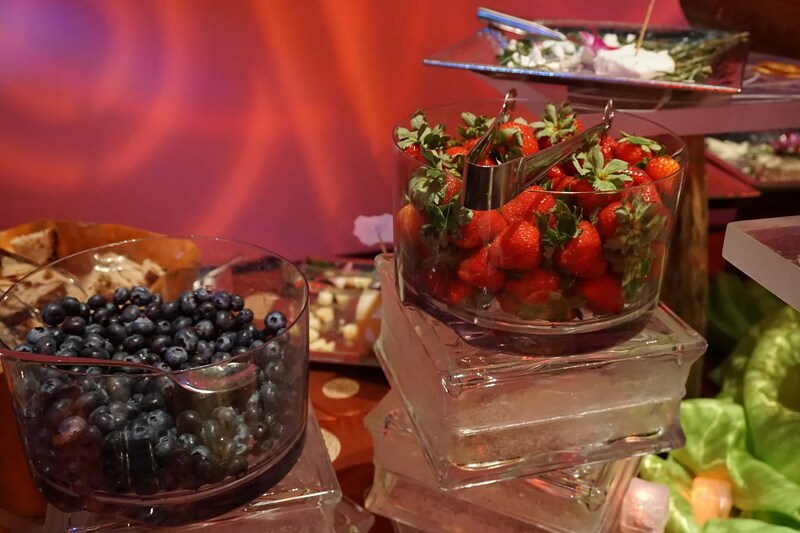 There was also a dessert station in this section which was hosted by yet another Grand Floridian chef. 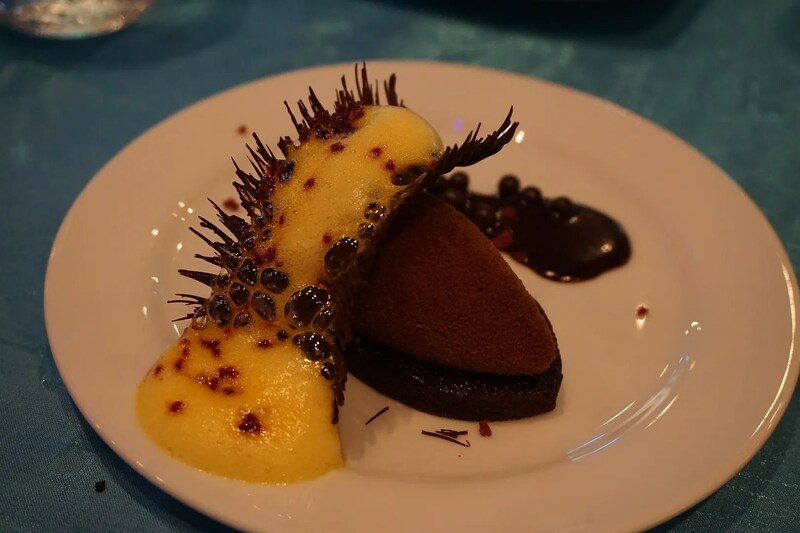 The resort’s Executive Pastry Chef, Erich Herbitschek, was serving Bitter Sweet Chocolate Crunch with Orange-Saffron Foam. This presentation was so interesting and photogenic. And I’m happy to report that its taste equaled its appearance. The 4th and last station in Section 4 was hosted by the chefs (Al Youngman and Mike Reitzler) from the soon-to-open restaurant at Magic Kingdom, The Jungle Navigation Co Ltd Skipper Canteen. 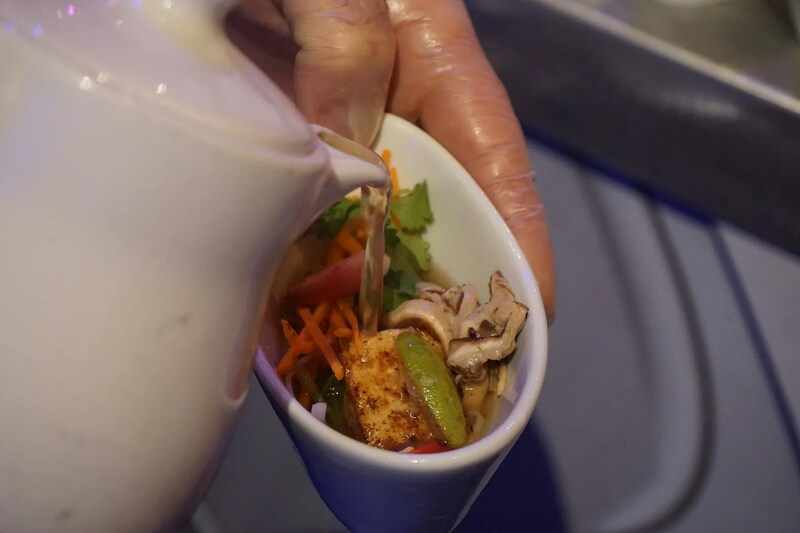 They were serving Tofu Pho Bowls, which I didn’t try. However I did get a couple of photos, first one of the bowls before the broth was added. 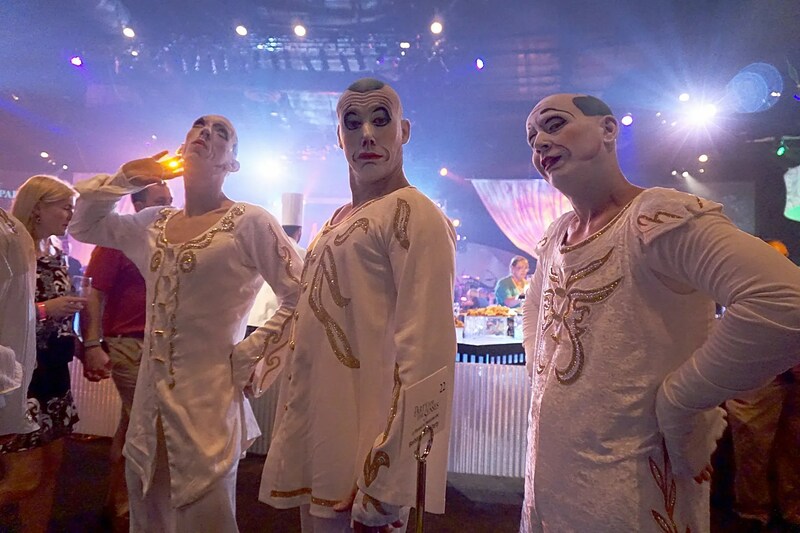 Now for an intermission from our tour of the tasting stations for a performance by La Nouba Cirque du Soleil. A few minutes prior to taking the stage, some of the performers came out to interact with the guests. I was busy taking photos of one of my plates so didn’t notice when these guys approached my table. One of them even stood behind me and tapped me on the shoulder to get my attention. I was so startled that I nearly jumped out of my chair when I saw him. Too funny! 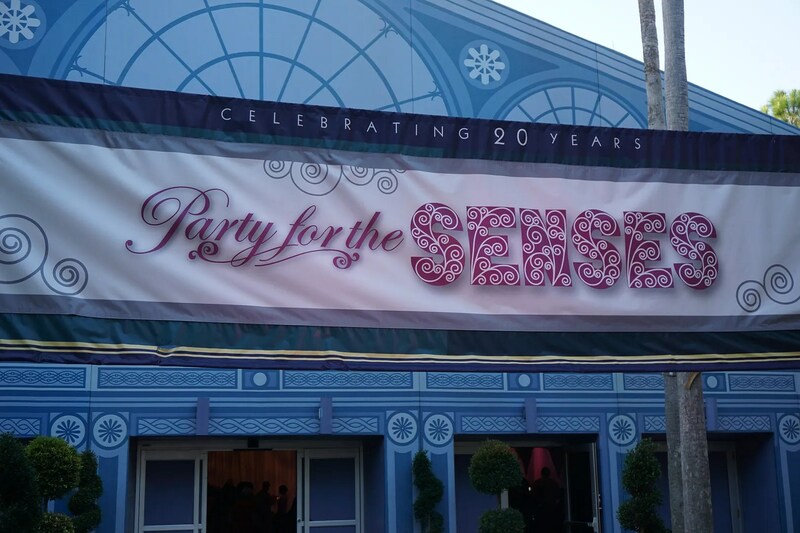 Continuing now on our tour of the food stations at the Party for the Senses featuring Disney chefs from around the world which I attended on Saturday, Oct. 24th. Disney World’s flagship resort, the Grand Floridian, was well represented at this party as they had a 4th station that was hosted by a GF chef. 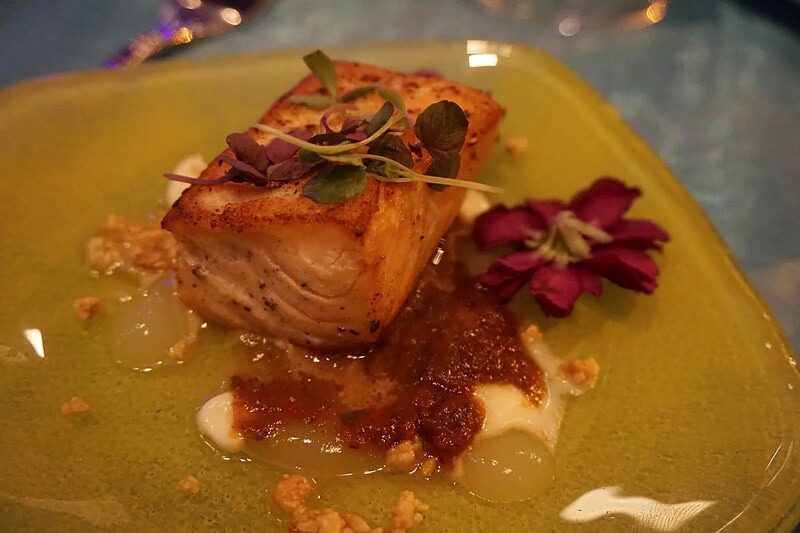 This one was located in Section 5 and had the resort’s Chef de Cuisine, Dennis Thompson, serving Verlasso Salmon with Piperade, Chorizo, Bergamot, and Marcona Almonds. This was good, but not good enough to make my Top 5 favorites. Also in Section 5 and falling in the good but not Top 5 material category was the offering at the California Grill station. 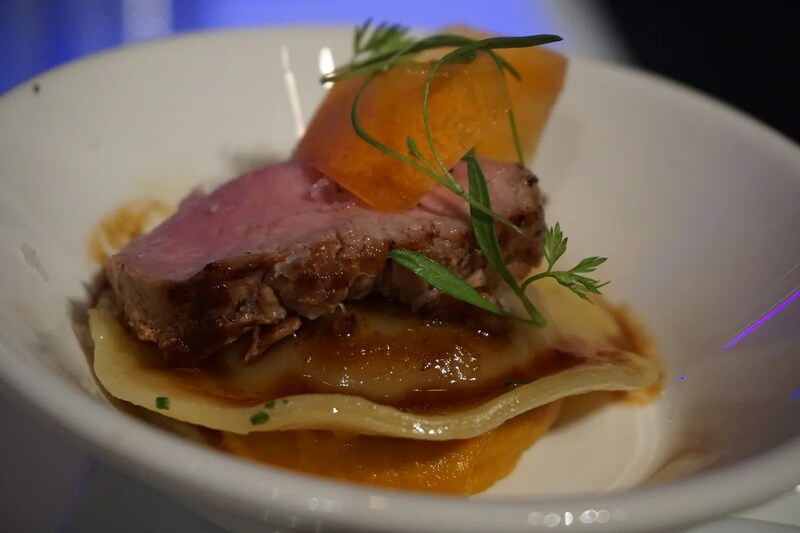 Brian Piasecki, the restaurant’s Chef de Cuisine, prepared Braised Boar Shank and Mascarpone Ravioli, with Carrot Silk, Seared Back Loin Medallion, Spiced Boar Jus, Crispy Boar Belly, and Petite Carrot Salad. 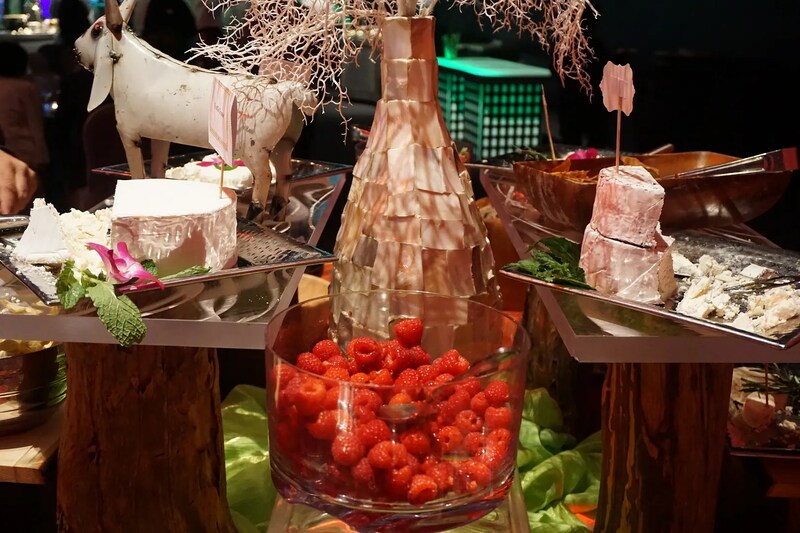 The last food station in this section was hosted by Anthony DeLuca, Chef de Cuisine for Animal Kingdom Theme Park. 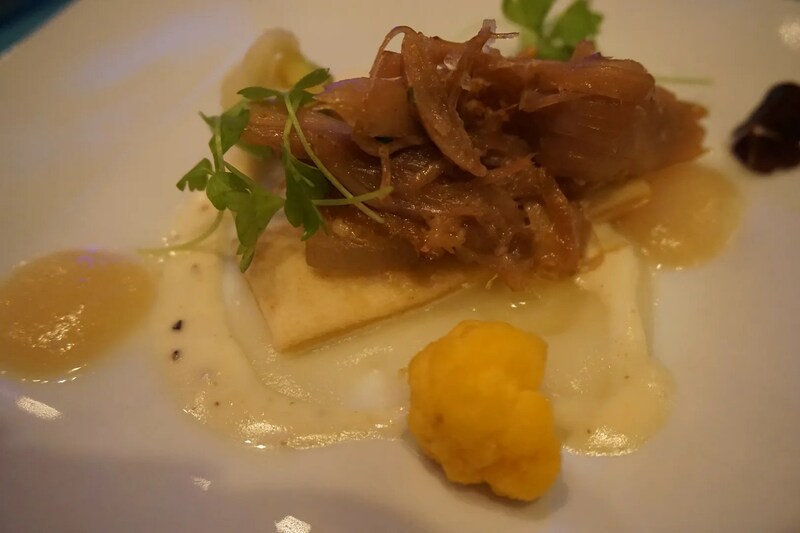 His station was serving Warm Duck Confit with Cauliflower Silk, Compressed Pear, Truffle Emulsion, and Walnut-Brown Butter Crumble. This was really good and did make my Top 5 favorites of the evening! Now for the last and largest section, which included a whopping 9 food tasting stations. 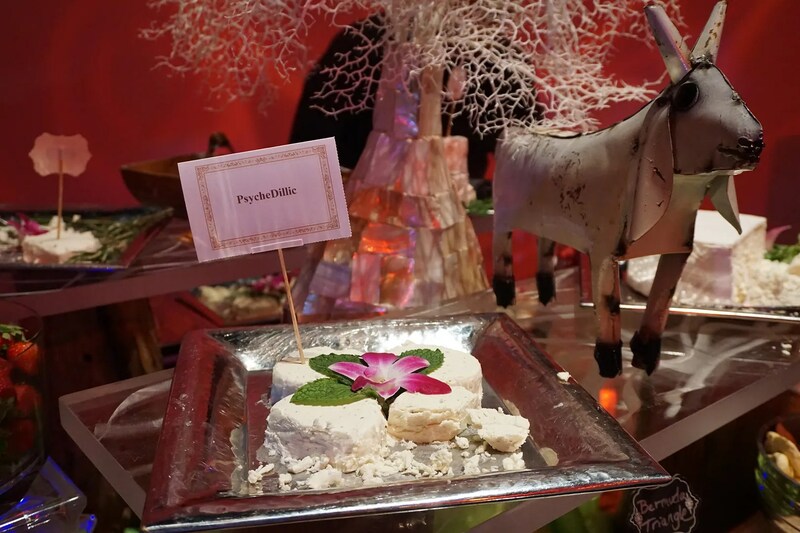 While one of these was a second Artisanal Cheese station hosted again by Gourmet Foods International, the other 8 were all hosted by Disney chefs. 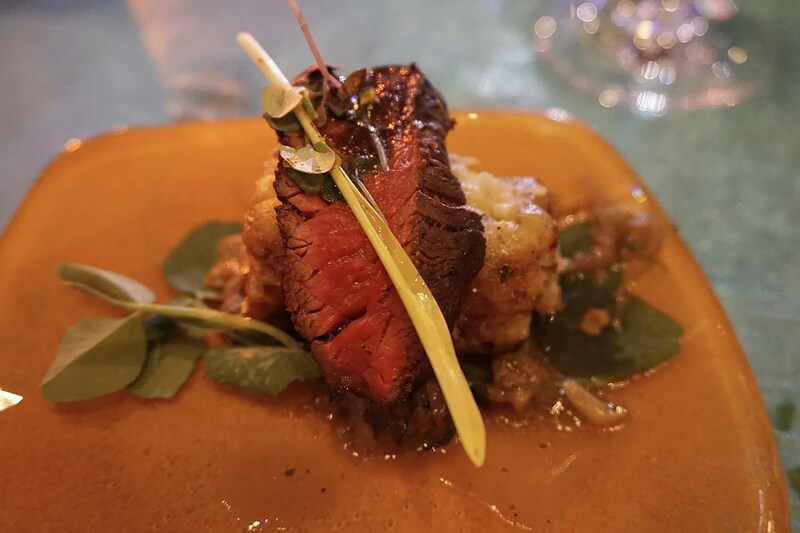 The first of these had Tim Keating, the Chef de Cuisine at Flying Fish Cafe, preparing Earthy Char-crusted Wagyu Beef Tenderloin with Antebellum Grits-Torta and Smoked Kissimmee River Oyster Mushroom “Colors”. This was excellent and among my Top 5 favorites! Next is the one food station that I not only didn’t taste the offering but failed to even take a picture of it. I thought for sure I had photographed this but sadly the picture of the Vegan Noodle Bowl with Cedar Smoked Soybean Curd and Roasted Autumn Root Broth is nowhere to be found on my camera’s memory card. My sincere apologies to those of you who were especially interested in seeing the vegan/vegetarian offerings at the party. Anyway, this station was co-hosted by im Oakley, Chef de Cuisine of the Wilderness Lodge, and Gardein. Representing the Aulani Resort of Hawaii was Pastry Chef, Ron Viloria. 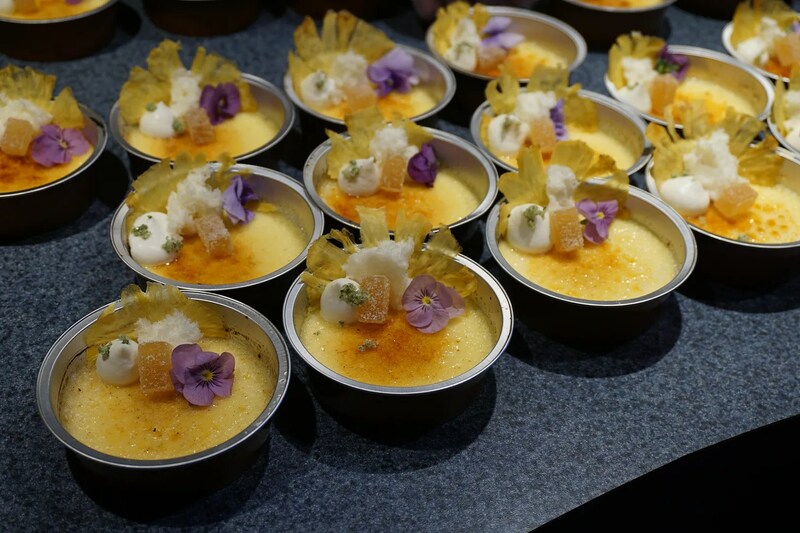 He along with Stefan Riemer, the Master Pastry Chef for Walt Disney Parks and Resorts Concept Development prepared the 5th and final dessert that was offered at this party. 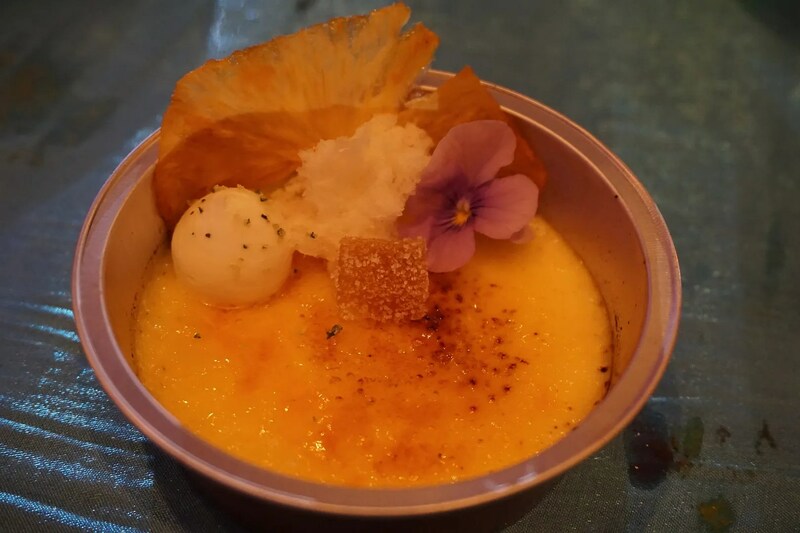 This was Crema Catalana, which is the Spanish version of the French dessert, Creme Brulee. Being a lover of creme brulee, I really enjoyed this. Three more chefs representing the Walt Disney Parks and Resorts Concept Development were manning the next station, including the Executive Chef, Lenny DeGeorge. 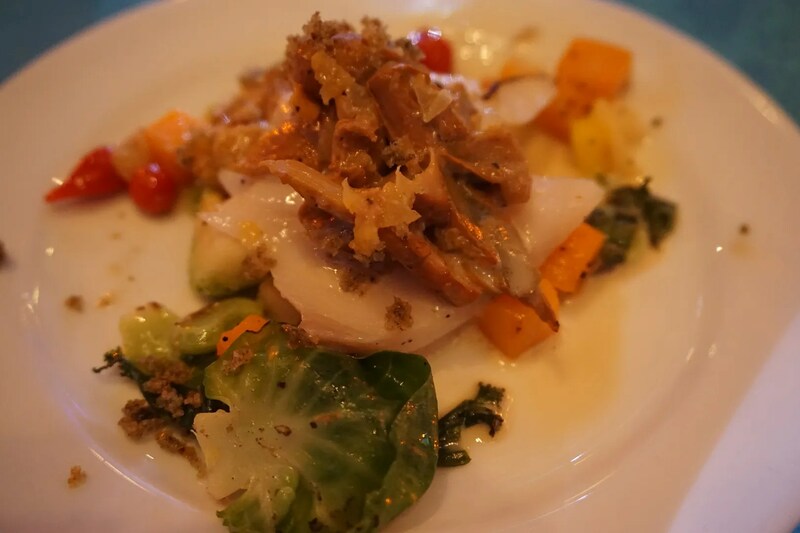 They were serving Celsius 51 Black Cod on Fall Harvest Succotash with Hard Cider Sauce. I don’t really remember this one at all and my notes contain only a one word description…YUCK! The opposite was true though of the offering from the next station, hosted by Michael Pythoud, Executive Chef for the Walt Disney World Resort. 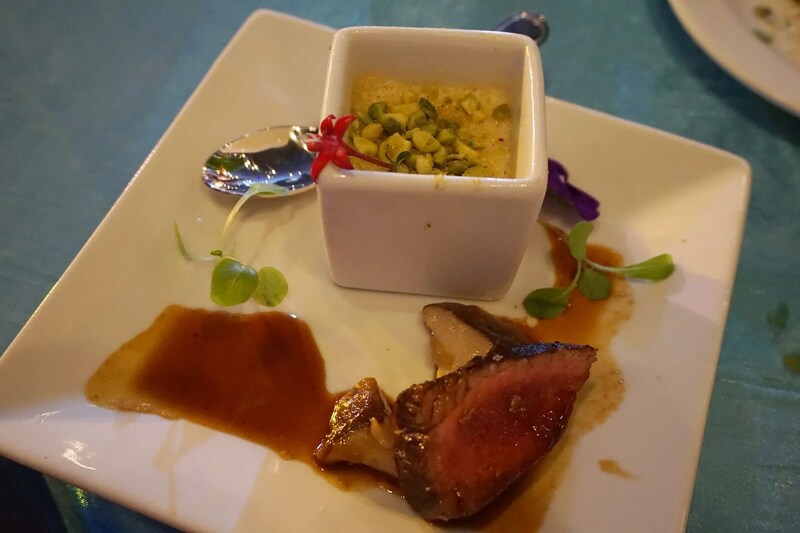 His station prepared Marrow, Truffle and Pistachio Royale, Porcini dusted Beef Tenderloin, Pieurote (grilled mushroom) and Bordelaise Sauce. I really enjoyed this and ranked it in my Top 5! 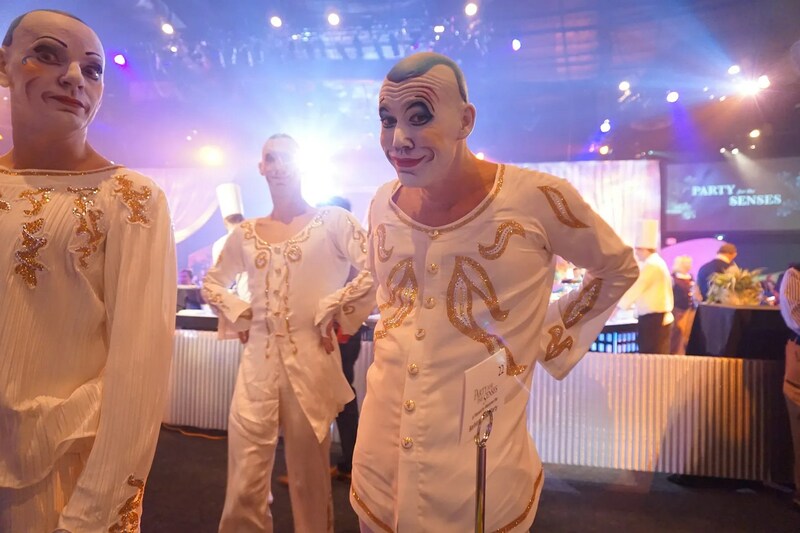 Representing the Walt Disney World Events Catering department were Executive Chefs, Robert Adams and John Clark. 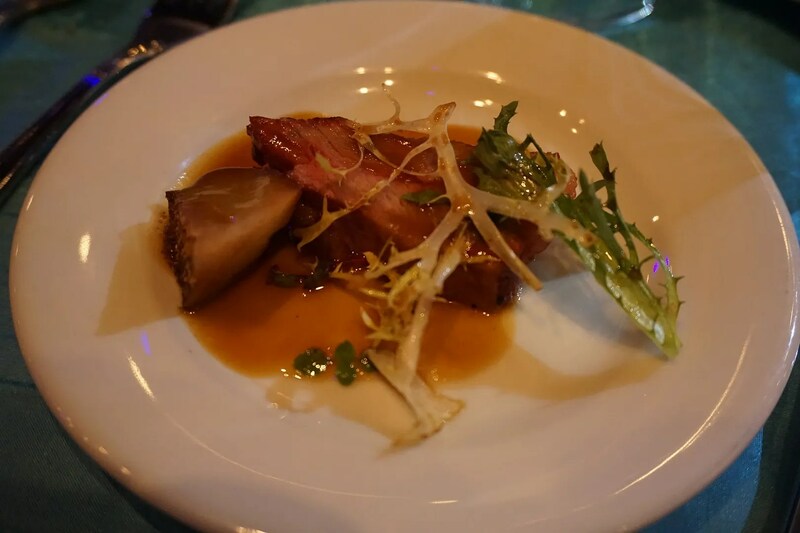 At their station they served Thirty-Six-Hour Lamb Belly with Spiced Pear, Micro Mustard, and Cider Gastrique. I loved this combination of flavors. This was another Top 5 favorite! Christine Weissman, Executive Chef, and Craig Schleider, Chef de Cuisine for Hollywood Studios were hosting the next station. 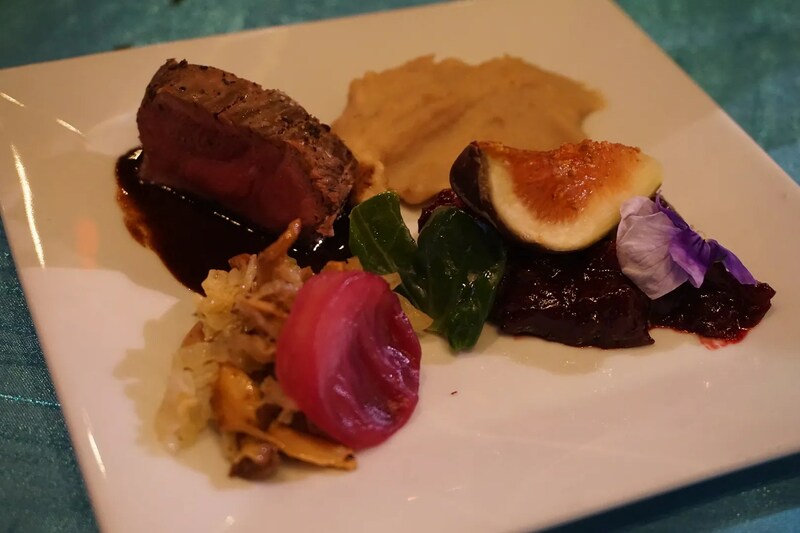 They prepared Crepinette of Bison Tenderloin with Napkin Dumpling, Shaved Black Truffle, and Red Current Reduction. The Bison had a strong smoky flavor that I didn’t care for. I didn’t get to try this one so no comment other than it had a beautiful presentation. And that completes our tour of 24 of the 26 food stations at the Party for the Senses held on October 24th. I somehow managed to taste the offerings from 18 of these. How did I do this? My success was largely due to my system for tasting. If after the first bite or two I didn’t really like what I was eating then I moved on to something else. In other words, only with my top 5 (or actually 6) and a couple of the desserts did I allow myself more than a few bites. And no matter how much I enjoyed a dish, I did not return for a second portion. I saw many people balancing multiple plates of the more popular dishes, such as the Wagyu Beef Tenderloin. But I did not succumb to this temptation. Though I did waste a lot of food with my system, I was able to achieve my goal for this evening, which was to try as many of the dishes prepared by the Disney chefs as I possibly could. 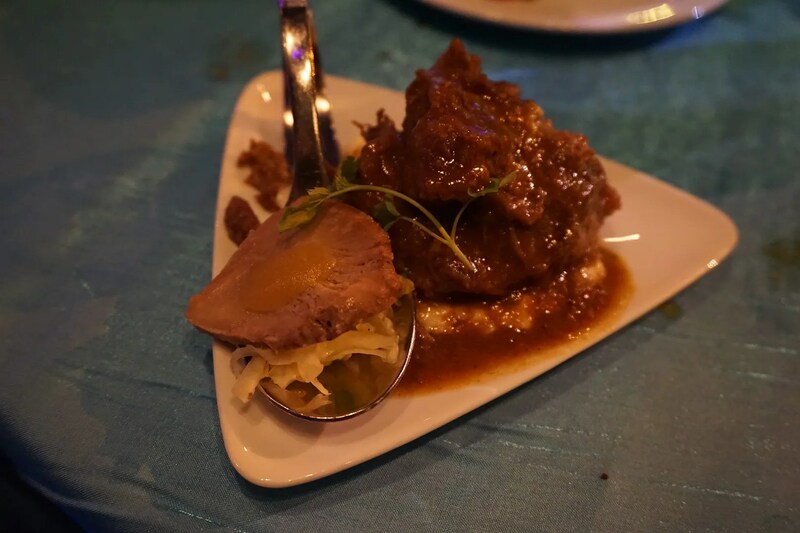 Oh, and I even tried a few new things which were previously outside of my comfort zone, like the pork tongue, thereby expanding my food horizons just a bit. So I left the party feeling satisfied that I had gotten my money’s worth. If my 2016 trip happens to coincide with next year’s PFTS featuring Disney chefs and I’m able to get the Reserved Seating then I would definitely do this again!